The story below highlights the importance of the above quote so beautifully. I wanted to summarise this story but the way its written is just perfect and summarizing or paraphrasing it would be a waste. The moral of the story is very simple, you should never care about what people “think” about you. Their perception is based on gossips, rumors and stories they have heard. Your reputation is nothing more than a random stranger’s or a group of random strangers’ notion of you. A perception viewed through that person’s or group of persons’ own len based on his/their own subjective criteria and evaluation. 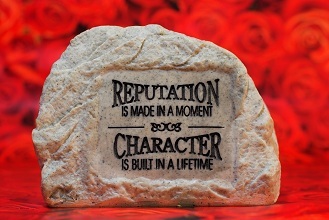 So, one should never waste time building up your reputation or defending your reputation. You should just focus on your character, focus on who you are and continuously test yourself against your own morale criteria. Remember, your friends, at least your true friends will know you are and no amount of gossip, rumors, insults etc about you will anger or provoke them because they know the truth.